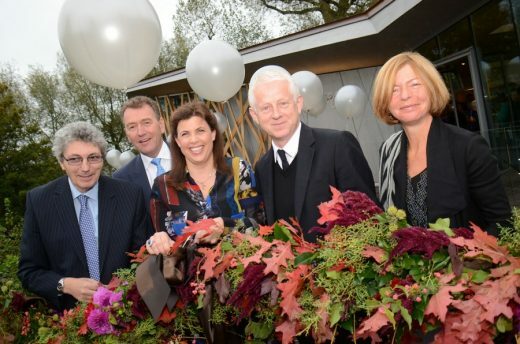 Television presenter and author Kirstie Allsopp, film director Richard Curtis and writer Paul Mayhew-Archer open new Maggie’s Centre in Oxford. Maggie’s, the charity that provides free practical, emotional and social support for people with cancer and their family and friends, has celebrated the opening of its new purpose built Centre in the grounds of The Churchill Hospital, Oxford. A full programme of support has been running from the new Centre since July 2014 and yesterday’s event marks the official opening of the completed Centre. A small interim Maggie’s Centre had been running in the grounds of the hospital since 2006 prior to the completion of the new building. The event was attended by Maggie’s Chief Executive Laura Lee and officially opened by television presenter and author, Kirstie Allsopp, film director, Richard Curtis and writer Paul Mayhew-Archer, in support of Maggie’s Oxford. The new Centre has been designed by acclaimed architects Wilkinson Eyre and was developed by Maggie’s working in partnership with Oxford University Hospitals NHS Trust to enhance the cancer care and support already on offer at the hospital. Every year 5,000 people in the region are diagnosed with cancer. As the number of people living with cancer increases, support becomes even more important. Maggie’s Oxford at the Patricia Thompson Building has more space and increased facilities for visitors to access a range of support that Maggie’s offers, including psychological support, benefits advice, nutrition workshops, relaxation and stress management, art therapy, tai chi and yoga. Laura Lee, Maggie’s Chief Executive said: “I’m delighted to celebrate the opening of Maggie’s Oxford at the Patricia Thompson Building. To watch a Centre come in to being is an incredible journey, one I have been privileged to share with every Maggie’s Centre built so far, but nothing compares to seeing the Centre filled with people benefiting from the support we offer. This year Maggie’s is celebrating 18 years of supporting people with cancer and the new Maggie’s Oxford Centre at the Patricia Thompson Building will be the 18th Centre to be opened in 18 years. The first Maggie’s Centre opened in Edinburgh in 1996 and Maggie’s Oxford at the Patricia Thompson Building joins 15 other Centres across the UK, an Online Centre and a Centre in Hong Kong. “Cancer is sadly very familiar to my family, I was 17 when my mother was diagnosed with breast cancer and after seeing her journey with the illness I realised the importance and value of having the right support to complement medical treatment. Something my mother believed strongly in. Maggie’s programme of support provides this for people with cancer and their Centres are warm places where you can find answers to questions and meet people who understand what you are going through. Built in the grounds of specialist NHS hospitals, Maggie’s Centres are warm and welcoming places, with qualified professionals on hand to offer an evidence-based programme of support that has been shown to improve physical and emotional wellbeing. Maggie’s relies on voluntary donations to support and grow its network of Centres and to develop its unique, high quality programme of support. Our aim is to make the biggest difference we can to people living with cancer, their family and friends. The Maggie’s Cancer Caring Centre at the Churchill Hospital in Oxford, which will serve the thousands of people affected by cancer across the region, has been granted planning permission. The Centre has been designed by architect Chris Wilkinson of Wilkinson Eyre Architects, bringing a unique and striking new building to the city of Oxford. 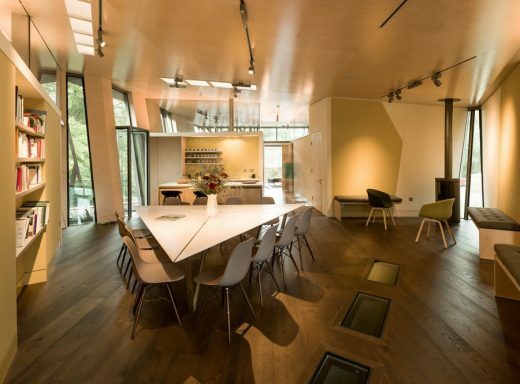 Maggie’s Centres greatly value the power of environment and design to lift the spirits and subsequently their Centres attract the world’s leading architects. Architects of Maggie’s Centres are asked to produce practical spaces in which people feel safe and welcome but also have their imagination and their curiosity kindled. Chris Wilkinson of Wilkinson Eyre Architects has followed Maggie’s brief to develop a stunning and practical design, which Maggie’s are very excited to take forward. The project is expected to start on site early next year. In response to the wooded site on the edge of the Churchill Hospital in Oxford, the design concept is for a “tree house” which nestles in amongst the vegetation supported on timber piloti to minimise disruption to the flora and fauna. Making use of the slope across the site, the single floor of the building floats in amongst the trees and is accessed by bridge from the road behind. The layout is composed of three wings emanating from a central space which is a direct interpretation of the brief allowing separate areas for information, emotional support and relaxation. All are linked to the central welcoming heart space of the building which has a kitchen, dining table and wood burning stove. The rooms open up to views of trees and fields beyond on the south side but are more closed to the north to control views back to the hospital and the nursery. The size and shape of each window and glazed panel has been carefully considered in relation to particular views and another layer of timber trellis overlays some of the panels to provide shade and privacy. Slot openings in the roof will allow shafts of sunlight into the spaces and openings in the floor will provide views through to the fauna below which, together with the external terraces, will help to create a strong relationship between the internal spaces and the natural surroundings. The form of the building is articulated as a series of three-dimensional planar elements which fragment, fold and wrap into one another. The floor and roof planes rotate geometrically on top of one of another so that the folds and wrapping of the roof walls and floor inform the internal planning and vice versa. The surface materials are largely timber and glass which are intended to give a friendly and familiar appearance in contrast to the usual clinical aesthetic of a hospital.